You never know who is going to step up for the children…….. Dana Layon of Zen Flow Yoga hosted our first ever Yoga Day! The event was at Vancouver Yoga Center and it was a great success. All day long Dana and other instructor’s lead us onto better body/mind health via one hour Yoga sessions. Dana also held a kids class and had over a dozen little ones bending and stretching for the children of the Dominican Republic. What a joy it was to see these children working for children less fortunate almost 4,000 miles away! Love really CAN build a bridge……….all across the world. Time Flies When Your're Having An Auction! I am just wondering wht happened to the month of October? And now most of November? Hopefully during this time I have been learning to live in the moment and enjoy every one of them since they quicky pass by. Too long since my last blog update that's for sure. We were all busy preparing for our Annual Silent Auction Dinner which was held at Colwood Golf Club in Portland Oregon on November 7th. The evening started out with music by Ted & Debi Mahoney of "Just Us" - they did a wonderful job of setting the mood for a fun evening. Thanks to everyone that donated auction items, bid on items, set up and showed up. My heartfelt thanks to everyone of you. I am always amazed how a small group of people can put such a wonderful evening together. Moreover, how a small group of people can make such an impact on the lives of children almost 4,000 miles away. Eleanor Roosevelt once asked "When will our consciences grow so tender that we will act to prevent human misery rather than avenge it?" Thank you to all those tender consciences! Love & Peace to all. Does anybody read this stuff? Cutting deals and more. One of the projects this summer was to purchase the uniforms for the children, distribute the uniforms and photograph the children. I was able to do that in August with the help of our Dominican school director, Yaneth. Yaneth knows everyone in the village by name. She is an incredibly dedicated woman with one child of her own, Luis Miguel. Yaneth is the daughter of Olivia the village's 68 year old Matriarch. At any time of the day you will see Olivia sitting in the shade under the big tree by her house surrounded by smiling playful children. Olivia and a couple of her friends approached me for a cash donation so they could buy fabric to have an outfit made for church. They needed 1,500 pesos for the three of them. That's about $42 in US dollars. Now $42 would not break me, but the problem is WHO do you give the money to? EVERYONE asks for some pesos for one thing or another. The last thing I want to do is corrupt in some way the very people we are trying to help. So it's always a struggle to figure out how to help meet thier needs without turning it into a welfare state. So I told them I'd think about it and we'd talk later in the week. The next day I was watching Olivia making a broom under her big shade tree. Carefully wrapping the vegetation around the broom handle that had been used over and over again. I wondered how many brooms I've throw into the garbage in my lifetime. I didn't have a clue, but I figured my number was quite a bit larger than Olivia's would be. We can learn a lesson about recycling from these people. Nothing is thrown away in the DR until it absolutely cannot be used again. Anyway, seeing her there working reminded I had work to do on the girls uniform skirts and got me thinking. A group from my church sewed 33 skirts but didn't have time to insert elastic in the waistband - so I made a deal with Olivia and her lady friends. 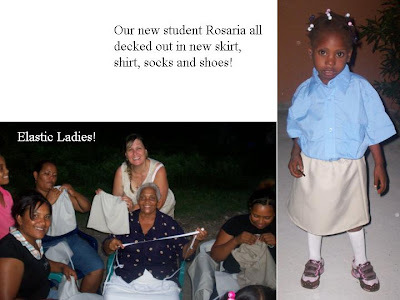 They could earn the pesos for their fabric by finishing the girls uniform skirts. So we all sat together under Olivia's big shade tree and worked hand in hand. And guess what?? I learned something else from these ladies. You insert the elastic, leave it long and tie the ends together. By untying the ends you can adjust the waiste later as the child grows. So simple. Okay so we may not be fashionistas with these waistbands, but they sure work great! Another lesson we can learn from these people. So we’re still heading back to where we started and the next thing we run into is an outhouse. So, hey why not snap a picture, right? We want to see the real flavor of the country! These outhouses are usually shared by a couple of families. Again, thanking the Lord for the little things in life…………. 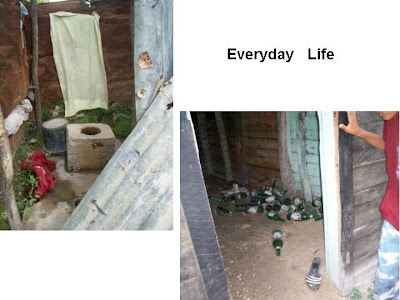 The last thing we run into on our journey is an empty house with a room full of beer bottles. Sigh…… what can I say? Somethings run across all borders and cultures. Anyway, here it’s probably safer for them to drink the beer than the water. Next stop we find a couple of boys that just caught some fish for dinner. Gracie held one up for us to see. Again, kinda small for this chubby American girl. Besides, I’ve already had some not too fond memories of eating fish from this river. I had to stay close to the bathroom for days! We took a different route as we returned and went by this house with their fresh washed laundry hung out on the fence. I like the photo of the house tucked in safely surrounded the banana trees and the colorful clothing. Not far from this house the children found some more fruit. Gracie the older girl pokes and shakes the tree so the fruit will fall and the children scramble to get some. I don’t remember the name of it, but its very small and for me, a chubby American girl, it was hardly worth the effort – haha! But, the children sure loves these little things. As we continued on our journey we could see the men working in the Yucca fields. Wow! What a sight, there were probably a dozen men with hoes working in the hot sun. The farming is done the old fashioned way, by hand! What I saw was an area of about 20 acres. Only by determination and perserverence could these men overcome this land and produce food for their families. I thought about the times I’ve heard people say things like, poor people are just lazy, poor people want a hand out or you make your own luck, or how about I had it rough, but I’ve succeeded they can too. All this heard from people born in the USA. I wondered, if I would be able to consistently work this land inch by inch, day by day in the hot sun. I wondered if I would be up to the challenge had I been born in generational poverty in a third world country. I really didn’t know the answers, I just took a moment to thank God for all the gifts I have received. I have a USA passport and that’s a BIG DEAL to me! Anyway, today they were making rows in the hard ground to help the water flow through the fields, that is why the water was on for us. It was Yucca planting time! The children were still on their hunt for Mango and would not stop long enough for me to venture out and talk to the men. Little did I know I would later meet two of those men and they would help me on my hunt for water. But, that’s another blog. Unfortunately for the children when we did get to the Mango tree, there was only one Mango and one little boy had already ran ahead and snagged it. By the time we got there he was happily munching away on the fruit.. (you can see him eating the yellow fruit in the photo below in Part 1) Interestingly the children were not upset at him and no one yelled “that’s not fair” as I imagine might happen in myown household. The children just shrugged their shoulders and turned around to head home. There was no need to continue further this direction, the fruit was gone. One day in July while in Habanero, Dominican Republic some children came up to me and said “aqua, aqua, canal, canal”. My brain quickly translated their “English” into – “Come with us, the water is running in the canal today!” So we headed off to a cement water irrigation canal that runs from the river across the field behind our school and into the Yucca fields beyond. I had been invited to be a special guest as the children took off on their adventure! As we walked I quickly realized this was also a hunt for food. Hunger is a part of the children's lives and so whatever you are doing includes keeping a keen eye out for food. Almonds, crab and fruit can been found if one is on the lookout. After walking about 1/4 mile we reached the canal and a dozen children started frolicking in the cool water. At first I tried to walk on the concrete side of the canal balancing as best I could with the help of the children. I wasn’t exactly dressed for this, plus the bottom of the canal looked pretty slimy and icky. I was regretting I had only worn my flip flops. The water looked cool and inviting, but sheesh, who knows what could be in it. Of course all the children were barefoot! In the sweltering afternoon heat I soon overcame my fears of the canal bottom and joined the children. How refreshing! Not only the water, but to be free of those adult fears that come with the knowledge of what might happen to us walking through a third world canal. The innocence of childhood allows those children a simple freedom I no longer enjoy. Although being with them certainly is an inspiration to be more childlike and enjoy the gifts that are right before our eyes!